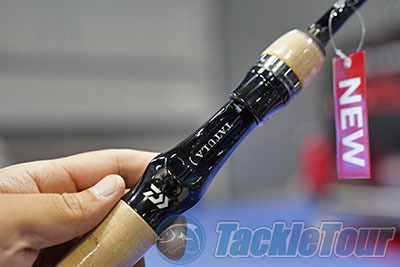 Introduction: Daiwa is going all in on Tatula, and the fast growing line is building a strong following among both mainstream and even performance oriented anglers. Of course Daiwa still offers a large assortment of enthusiast class product but for many Daiwa fans when it comes to everyday reel and rods the Tatula collection is now where they turn. This ICAST Daiwa not only introduced new Tatula reels but a complete line of new Tatula Bass Specific rods to pair those reels with, as well as a number of new Tatula Elite Series signature rods. 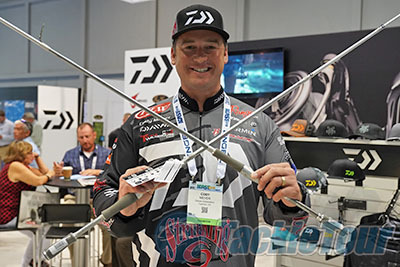 Tatula Bass Rods: At the show we were able to check out the new Tatula rods in Daiwa's booth and get a feel for them briefly on the water. 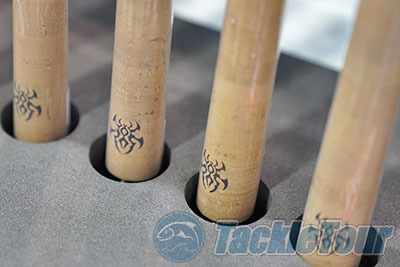 The new rods feature a clean design with natural cork grips and a black matte blank. There is no mistaking that this is a Tatula rod with the spider logo laser etched into the cork handles and integrated into the gloss section directly above the foregrips. 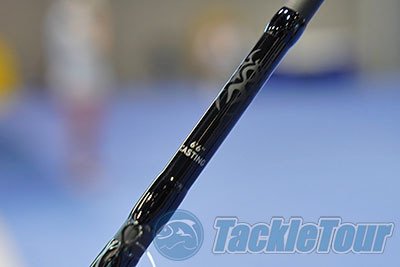 Overall the new Tatula rods have an understated yet elegant feel to them. In total the Daiwa Tatula Bass Rods consist of seven categories and 21 different actions all designed for bass fishing applications. There are 7 spinning designs, 6 casting models, 2 flipping rods, 2 shallow crank/jerkbait rods, 3 glass cranking and spinnerbait rods and even a frog fishing specific rod. The Tatula Bass Series rods are constructed out of the company's lightweight X-45 concept blanks which are rolled with Braiding-X Fiber to reduce blank weight and resist ovalization, allowing for greater hoop-strength loads and better load up when setting and fighting fish. The hardware on the new rods consist of tangle free Fuji FazLite guides, which we are seeing increasingly chosen on more and more rods at the sub two hundred dollar price point. These guides seem to deliver similar attributes and performance to alconite and can handle braided lines well. 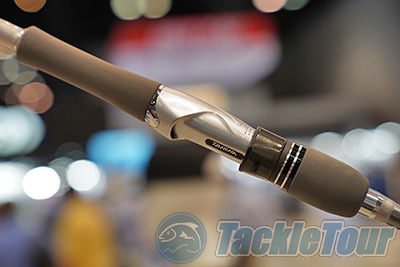 Depending on the rod the new Tatula Bass rods will retail for $149-$169 dollars and comes backed with a 5 year warranty. Tatula Elite, Cody Meyer's New Rods: If the Tatula Bass rods are not high end enough for you the next step up are the Tatula Elite Series Bass Rods which feature higher-end X-45 concept blanks as well as make use of premium components, including some rods making use of the AGS Air Guide System, Daiwa's original carbon fiber guides that are light and strong and do not inhibit the natural bend of the blank under load. 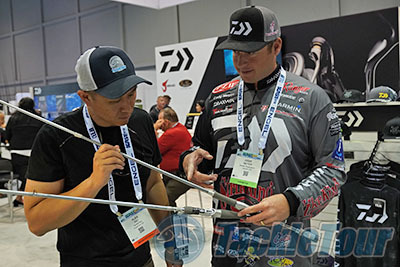 The Tatula Elites rods are all designed in conjunction with Daiwa's Pros which include Ish Monroe, Brent Ehrler, Randy Howell, Cody Meyer, Seth Feider and Takahiro Omori. Each of these higher-end rods are created with their input and focus on their signature fishing styles, all while maintaining the quality and performance required for the abuse of tournament fishing. 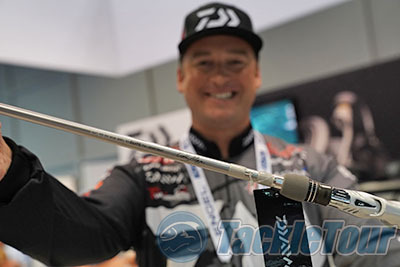 At the show we also met up with Pro Angler Cody Meyer who showed us the new additions the Tatula Elite lineup. One of the most exciting of which is his new 7'6" heavy action "Searchbait" rod which is designed for smaller swimbaits like the Keitech and Strike King Rage Tail. 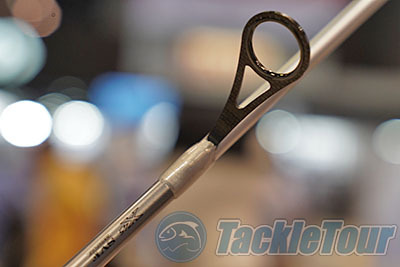 This rod is designed to make extremely long casts to cover a lot of water in search of those big fish. It comes with Fuji Alconite guides and will retail for $179 dollars. Another new rod in the lineup that Cody showed us was Ish's new Long Cast Frog rod which is designed for casting frogs further and getting it way back into structure. This rod is beefy enough to handle larger swimbaits as well as some flipping as well and even though it comes with those lightweight Daiwa AGS Guides it is rated to handle 55-80 braid no problem. 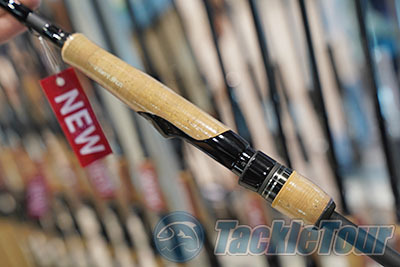 This rod is the most expensive new Tatula Elite rod at $299 dollars. For bigger baits Ish also has another new 8 foot swimbait rod for bombing baits all the way up to 9 ounces in weight! This rod makes use of Fuji Alconite guides and has a heavy action and plenty of backbone to really push those larger swimbaits, and even though this rod is designed for the big stuff it still felt very light and balanced. Enthusiasts will likely focus on what Daiwa is perhaps known for in the past, ultra high end reels like the Steez and Exist, and while halo products like these are what put Daiwa on the map it is the Tatula that is now paying the bills. The Tatula Bass and Tatula Elite rods are some of the best new rod offerings designed specifically for bass this year, and best of all they won't break your bank to fish them this coming season.